score one for the united kingdom! Whoa, not only that but it's available now! Score two actually - We got the SB/SD first. Just a note to those in the USA: the UCS Falcon first came out in the UK but was available to the USA within 48 hours. I hope that is the same timeframe here too (instead of weeks or months). Judging on what happened last year, it will be. How much is it? And when do you think it will let people in the US order it cause it doesnt let me go on the page. Yes, I agree that we pay so much in the UK for these compared to the US, but I did expect this one to be around the �100 mark... so I am surprised. I think one of the arms comes in the old style, and the other one comes in the new style for each BD. Here in this picture we only see one side of the DB. Gotaa order when it shows on the US site. Anxetiously waiting. Yea-haw! Now lets buy this thing, kid, and go home! Ah, I hope this string of one-uppage for the UK continues with the rest of the 2007 sets! nice! I wonder if the brand stores have them now then ? I shall give Brighton a ring tomorrow sometime. ALL KIDDING ASIDE, is the "radar dish" in the front of the MTT an X-Pod cover? At least she's never fallen off a segway. And did you see what an absolute hash the yanks made of simply getting some stairs up to her majesty's aeroplane? These ruffians have no respect for the Royalty, typical! and let's of course not forget that it's also available in the down under . . . but whoa Lego, slow down! I didn't think i'd be saying this but it's all happening to fast!! I think this one is now out of my imediate price-range . . .
the cheese is overflowing!!!! Get his majesty to safety!! Shop@Home have also put the droid battle pack in the episode 1 section (even though it has super battle droids) and the sandcrawler??? Plus its still available in the episode 3 section? Back on topic: My parents won't let me get the MTT now because it is my B-Day in June so they will say "wait until your birthday". OH I see! What makes the UK so special, huh! just kidding. Can't wait until its availible in the US! It's available in Australia yep but it costs $179. That's the same price as the 6211 Star Destroyer. Unless your really like the MTT and willing to pay that price otherwise outsource it from the States. Woah, I just checked this out. I must say, this makes me want to buy it more. 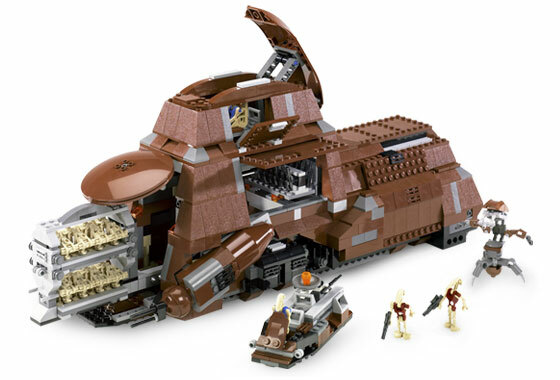 It has a ton of brown pieces, so if I do get it, and then I start building it, it won't feel like another Star Wars set. Just look at that. It looks beautiful, and those droids just makes getting SBD's more of a hassle. Each droid has 2 arms, one of the arms is the new one to hold the weapon, the other arm is the old arm. It was explained above ^, just look at my post!